This is always the safer route to prevent violation of copyright as it does not reproduce content. It allows the Library to track usage of subscription-based resources, which is one of the elements considered as part of its renewal decisions. Step 1: Access an electronic book in the Library Catalogue. Step 2: Under "Send to," click on "Permalink" to locate the permalink URL. Step 3: Copy the "Permalink" URL. This provides a permanent link to the record in the Library Catalogue, from which users may connect to the full-text e-book. Note: Due to licensing limitations, vendors may restrict the number of concurrent users of an e-book at a given time. Step 1: Find the full-text article in electronic format. Step 2: Identify a persistent link that you can use. See Choosing a Persistent Link below. Step 3: Paste, email or embed your link. Why not just copy the URL in the address bar of your browser? Often that URL is not a persistent link; it is a dynamically generated URL specific to your search session. Tip: Want to know if a link in the address bar is persistent? Copy it from your current browser (ex. Firefox) and paste it into a different browser (ex. Chrome). If the link does not work, it is not a persistent link. 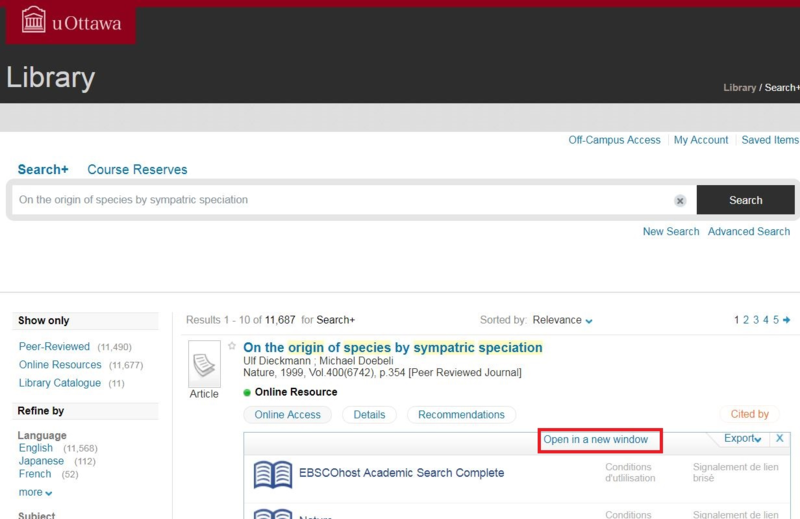 If you are linking to articles available through the Library’s online subscriptions, make sure users have off-campus access by including the proxy prefix (https://login.proxy.bib.uottawa.ca/login?url=) at the beginning of the URL. Adding the link in Virtual Campus? If creating a link in a block of text using the “Insert QuickLink” function, apply this workaround (method 3). TLSS and D2L are both of aware of this issue and are working on a solution. Types of persistent links include: (1) Digital Object Identifiers (DOI), (2) Persistent links offered by database vendors, and (3) OpenURLs. Both DOI and OpenURL are widely adopted standards meant to give persistent access to online items independently of the platform on which they are found, and regardless of future location or ownership changes. DOIs are most commonly found in scientific literature mostly after the early 2000s. Locate the DOI in the article information. Many, though not all, databases offer a stable way to link back to a specific article. Unfortunately, there is little or no consistency between how one vendor presents a persistent link from another vendor. Identify the persistent link. A label such as "Permanent link to this record", "Stable URL", "Durable link", or "Linking options for this record" would likely refer to a persistent link. The OpenURL opens the SFX Menu window, showing you the sources through which the article is available online. If you have located your article through the Library Catalogue, click “Online Resource”, which will open in a new window. If accessing an article through another database, click the “Afficher!/Get It!” icon. Copy the URL of the SFX Menu window. Note: Not all publications permit access from the OpenURL directly to the article. Instead they may link solely to the main publication page, requiring the user to select the issue and subsequently the article. For this reason, it is important to accompany an OpenURL with full citation information. 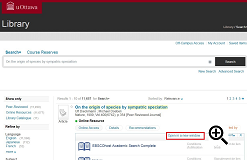 To link to other types of electronic resources, such as videos, sound recordings or datasets, made available through Library subscription, follow the instructions above on how to identify a persistent link and make it accessible off-campus. If you have any difficulty with the above instructions, please contact your Subject Librarian or the Copyright Office.